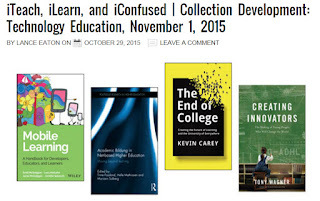 This past year, I was given the opportunity to write a Content Development article for Library Journal, a publication I have written different pieces for over the years. 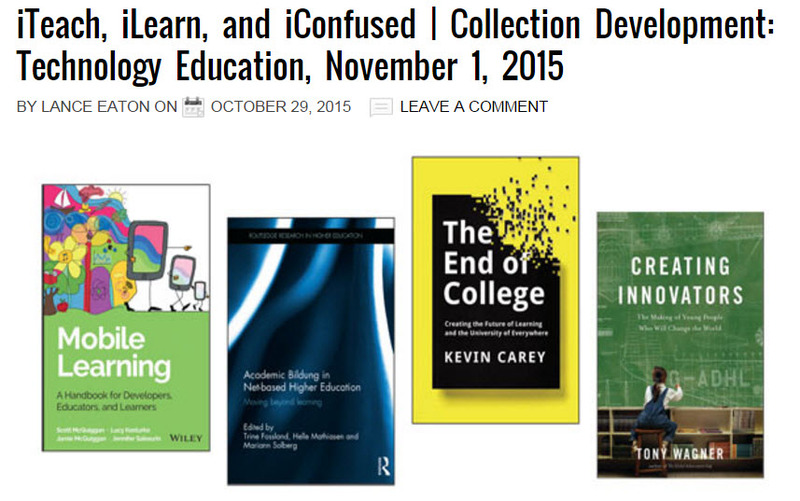 This article's focus was on library resources focusing on books related to technology and education. It was a fun process to find these different resources and explore them. Here is a brief snippet of the article along with a link to the full piece. "With the ever-increasing pace of computer processing, technology flies at the speed of light, and our devices are quickly underperforming and becoming clunky and outdated. Yet most books take more than a year from concept to publication, leaving titles on education and technology with a short shelf life. As an instructional designer who works with faculty to help them use technology in pedagogically sound ways at North Shore Community College, I am constantly looking for great books on working with technology in education. Other librarians, too, must find relevant and long-lasting titles in a field that shows no signs of slowing down. Timeless books may be unicorns, but there are several considerations that can help develop a robust collection of technology and education volumes and resources." Click through for the full article on Library Journal.